Lustrous satin readies the signature woven construction of this Bottega Veneta box clutch bag for special events; ayers snakeskin adds exotic allure. 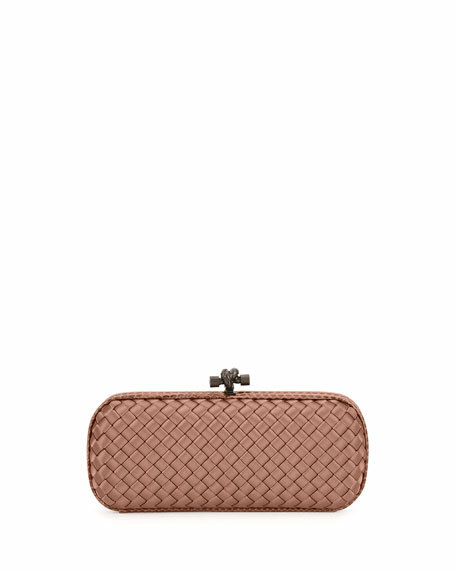 Bottega Veneta woven satin clutch. Shiny tonal snake trims hard-shell body with rounded corners. Burnished gunmetal push-lock clasp with knotted, woven design. 4 1/2"H x 10"W x 1 1/2"D.
Edie Parker hand poured acrylic glittered clutch bag. Removable chain shoulder strap. Hinged opening; kiss-lock clasp. Signature vanity mirror inside with engraved logo. Fits a smartphone, including an iPhone® 7 Plus. 4"H x 10"W x 1.8"D. "Flavia" is made in USA. The uninhibited Good girl gone Bad finds herself in a luscious floral whirlwind in the garden of good and evil.